As soon as you step foot in L’Euguélionne, it feels like home. This feminist bookstore, in the heart of the Gay Village, is a well-lit, colourful space with clean decor. 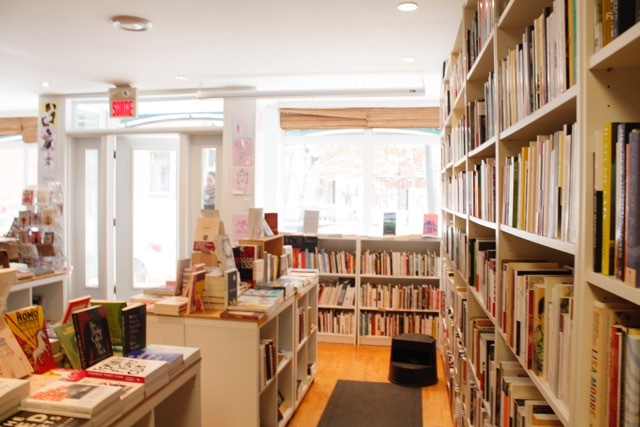 In business since December 2016, L’Euguélionne is the first bookstore to strongly advocate for the feminist community in Montreal since the 1970s. Specializing in women’s literature, L’Euguélionne also offers books aimed at diverse identities, from queer and anti-racist to asexual, two-spirited and anti-colonial. The bookstore often organizes a variety of literary and feminist events, such as the book launch of Ciel by Sophie Labelle held on Feb. 8. A few days later, the bookstore hosted the play Black Boys, which explores identities of queer black men. “I decided to partake in the feminist movement because of [many] experiences in my life. It kind of came naturally,” said Stéphanie Dufresne, a graduate from Concordia’s women’s studies program. She co-founded L’Euguélionne alongside Nicolas Longtin-Martel, Sandrine Bourget-Lapointe, Camille Toffoli, Karine Rosso and Marie-Ève Blais. This Montreal bookstore strongly advocates for the city’s feminist community. Photo by Catherine Hansen. According to Dufresne, by critiquing definitions of feminism and listening to diverse voices, the movement can grow in strength and popularity. “If [feminism] becomes a shared understanding, that is what makes it a movement and not just a personal belief,” she said. The founders of L’Euguélionne organize events in support of feminism regularly to increase knowledge about the movement in the Montreal community, particularly among younger generations. “If young girls grow up in a world where saying you’re a feminist is trendy, even though it might be superficial at first, it is better than growing up in a world where feminism is looked down upon,” Dufresne said. She encourages young women to learn more about feminism, whether that’s by reading feminist blogs or books by authors like Roxane Gay. “We need knowledge to properly fight this battle,” Dufresne said. L’Euguélionne is located at 1426 Beaudry St. It’s next event will be a panel discussion for the launch of a book concerning research on LGBT families, held on Feb. 28 from 5 p.m. to 7 p.m. Entry is free.